Paperback, 8.75 x 11 in. / 192 pgs / 176 color / 75 bw. Edited by Marta Kuzma, Antonio Cataldo. Text by Robert Smithson, Venturi and Rauch Architects and Planners, Peter Eisenman, Steven Izenour, Marta Kuzma. 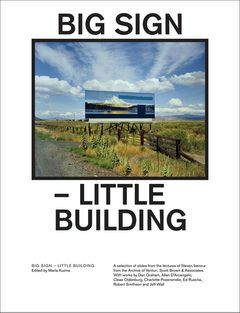 All the works selected for Big Sign Little Building explore new interpretations of landscape that synthesize art and architecture. Artists include Charlotte Posenenske, Ed Ruscha, Claes Oldenburg, Allan D’Arcangelo, Robert Smithson and Jeff Wall. FORMAT: Pbk, 8.75 x 11 in. / 192 pgs / 176 color / 75 b&w.